1. In a cocktail shaker add 2 barspoons or 1 tablespoon of the italian bitter orange marmalade. 2. Then add Galliano Italian Herbal Liqueur and either Bourbon or Irish Whiskey. 4. 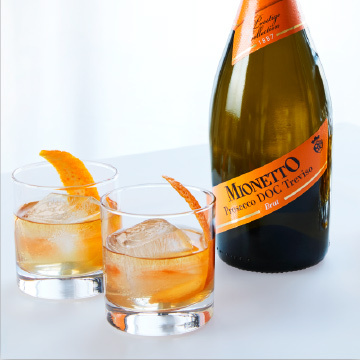 Before straining, top the shaken contents with 4 oz Mionetto Brut Prosecco. 5. Strain into an old-fashioned glass over a large ice mold or a couple of ice cubes. 6. Top with 4-5 dashes of Angostura Aromatic Bitters. 7. Garnish with Orange Peel or twist.